Searching for an insurance company that understands your needs? You've found it. Looking for a Group Insurance Plan with complete coverage? We are pleased to announce the launch of our new Member/Employer/Broker Portal! The updated portal provides you an easy access to the information you need and other useful information. For more than 25 years we have focused on offering fully-customizable employee benefit packages that give companies the peace of mind that comes from top-quality coverage at prices that help protect the bottom line. Nippon Life Benefits delivers a full range of products so each employer can create the perfect benefit package for their company. If you want to be treated like a respected family member instead of a number – you have come to the right place. We know that having access to benefit information is important therefore we provide 24/7 access through our mobile app and online portals. I really can’t say enough about how much our clients, agency, and account team enjoys working with Nippon Life Benefits. ..
Nippon Life Benefits’ reasonable rates were the initial attraction but the personal customer service is what keeps our business. 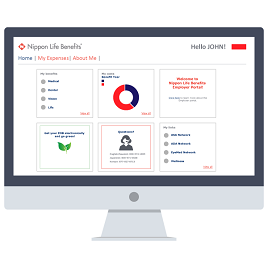 Our account manager ..
My team and I have had a wonderful experience with Nippon Life Benefits on the implementation of our client. Their service..
It’s been great working with you over the last year especially during open enrollment. You’ve done a terrific..
Nippon Life Benefits has been an excellent insurance provider for our Firm the last few years. The attentive..